We can make valiant efforts to live our healthiest life by eating the right foods and choosing green products. However, no matter how committed we are to living a clean life, toxins are all around us. We encounter them on a daily basis, so it’s important to have the resources to minimize our overall toxic load. Ultimately, we all have unique genetic responses and tolerance levels for toxins. Some of us may be more sensitive to them, especially those healing from chronic illnesses or autoimmune diseases. The best way to take control of our health is to eliminate as many foreign bodies and toxins from entering our body as possible. 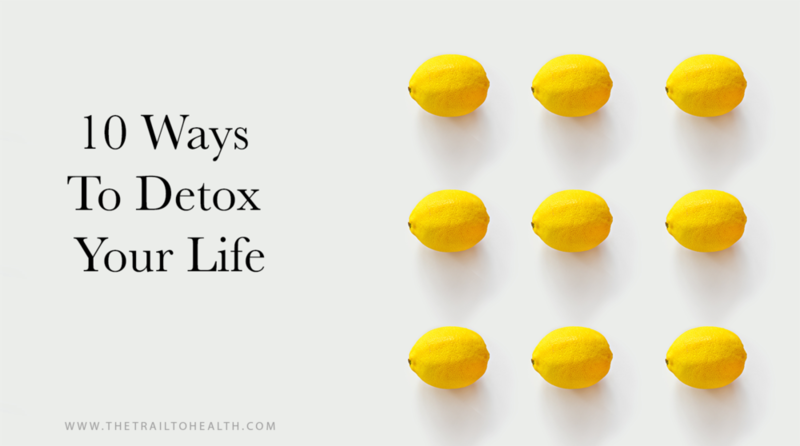 With that in mind, here are ten ways to detox your life. Our homes are our sanctuary, so it’s crucial to make them a toxic-free haven. Unfortunately, mainstream home cleaners are chock full of harmful chemicals and toxins. The same goes for dish soaps, which can actually contain gluten which is a no-go if you’re gluten-free. Nontoxic and safe home cleaners I trust are Branch Basics, Ecover and Seventh Generation, who also has a gluten-free dish cleaner. Generally, fragrances are extremely toxic and can induce headaches and allergies. Instead of using scents and air fresheners, make a safe home remedy by adding water and your favorite fragrant essential oil into a spray bottle. Voila! Fresh and safe air. Another great idea is to use a home diffuser to mist your home with clean, essential oils. Unfortunately, cosmetics and beauty products are riddled with toxic chemicals. However, there are a variety of clean, nontoxic beauty products that are organic and use natural oils as a base. A great resource is to use EWG’s Skin Deep Database to measure the toxicity levels of cosmetics. Sunscreen is a paradox: it’s supposed to protect you from getting skin cancer, however the chemicals in sunscreen are carcinogenic. What’s up with that? Honestly, sunscreen is a huge concern because it has so many toxic chemicals and misleading ingredients. For example, a main ingredient is Retinyl Palmitate, a form of Vitamin A, which has caused skin tumors and lesions when applied in sunlight. It’s obvious that sunscreen is a danger zone. So, opt for lower toxic brands that are made from zinc oxide. Also, our bodies love and crave Vitamin D, so spend about ten minutes in the sun before applying sunscreen. We need to talk. I’m just going to be honest, this is not working and it’s time to break up because you’re hurting me. That’s right, I’m talking to you, Teflon. One major way to cut out toxins in the kitchen is to use clean, green cookware. Teflon is straight up toxic and should be nowhere near our food, especially when it’s chipped and releases harmful chemicals into the food we consume. Instead use cast iron, stainless steel and ceramic cookware. Of course, food is major component when it comes to eliminating toxins and chemicals from our bodies. Here’s the deal: food pesticides and added hormones are toxic. That’s why it’s important to do a major evaluation of what we eat and cut out toxins in every way possible. This is a huge topic but I’ll touch on the fundamentals of eating nontoxic foods: Choose grass fed beef and finished meats, pastured eggs, organic fruits and veggies, and avoid GMOs at all costs. If you want cheat sheets, EWG has a great resource of the dirty dozen and clean fifteen. Also be leery about drinking teas, which can be full of pesticides, toxins and artificial flavors. Honestly, plastic is so passé. We’ve grown and we’ve learned: plastic is toxic not only to our bodies, but to the planet. When plastic is heated and cooled it releases toxic chemicals. Conveniently, there’s an inexpensive and easy swap for plastic Tupperware: glass. In the kitchen, eliminate plastics and use either glass containers, mason jars or food storage containers. There’s nothing like a good sweat sesh to detox and flush toxins from the body. Sweat it out in an infrared sauna or with a consistent fitness routine. Either way, sweating is a natural way to detox and does the body good. This might seem unconventional, but it’s actually crucial to our wellbeing. There is simply no room in our lives for toxic people; they drain us emotionally and mentally and take, take, take. This is a gentle reminder that it’s ok to cut out toxic people. In fact, doing so will alleviate stress, tension and negativity. This opens up the door for positivity and healthy relationships that bring you joy. There you have it! I know it can seem overwhelming when we realize that toxins and chemicals are everywhere. I also know how empowering it is to take your health into your own hands and advocate for a toxin-free life. 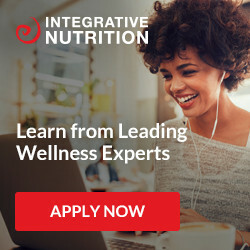 With these tools and resources, you can start eliminating toxins and inviting a more clean and healthy, nontoxic life. Are Your Thyroid Meds Gluten Free?